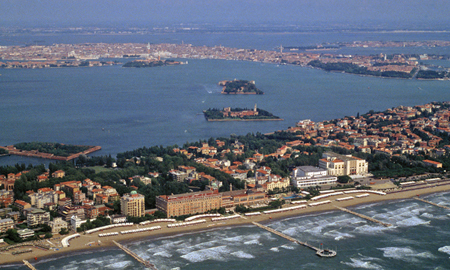 Lido and Pellestrina are offshore bars marking the border between Venice Lagoon and the Adriatic Sea. These islands had an outstanding strategic function in protecting Venice from the fury of the sea and enemies’ invasions. They were locations for Monasteries and Convents, that were centres of prayer, culture and knowledge; they were also turned into Hospitals and Lazarettos, in order to help preventing the spreading of plague and epidemics. In ancient times the inhabitants of these islands were skilful hunters (as a matter of fact a deer is represented on Malamocco’s coat of arms) and they learned to respect the lagoon environment, how to cope with it, and to sail the lagoon waters with flat hull boats, pushed by oars or sails. Pellestrina Island is a thin, 11-kilometre-long stripe of land situated between the Adriatic Sea and Venice Lagoon. This little fishermen’s village is characterized on the lagoon side by its colourful houses, on the sea side by Murazzi and sandy beaches, regularly frequented by locals. It can be reached by public boats (Line 11) from Chioggia. You can visit the island by foot, by bus or by bicycle, just following the roads along the lagoon or along the Murazzi. Here everybody knows each other, doors are often left opened, the air is filled by the scent of sea and grilled fish because inhabitants use to roast fish outdoor, in front of the threshold. The offshore bar of Pellestrina comprises Ca’ Roman Lipu Naturalistic Reserve in the south; the residential area of Pellestrina, with its four quarters (Busetto, Vianello, Zennaro and Scarpa, the four families sent by Chioggia’s Chief Magistrate to repopulate the island destroyed by the Genoese during the war against Venice in 1380); Portosecco, where in summer days it is not rare to see chatting women, sit along the alley while making beautiful bobbin lace on lace pillows, waving together their little spindles; San Pietro in Volta, with the 18th century church, low houses, vegetable gardens and vineyards; and finally, Santa Maria del Mare, the green lung in the north of the island, rich in tamarisk, poplar and fruit trees. Murazzi are typical of this island. They are imposing breakwaters made of Istria stone and one of the most impressive defence from coastal storm built by the Serenissima in the eighteenth century. The history of Murazzi and the 1966-year flood are described through re-enactment, pictures and movies in the little Museum of the Southern Lagoon, housed in the former Goldoni School of San Pietro in Volta (booking compulsory). Nowadays Murazzi are well liked by people who love to sunbathe there. Pellestrina Island is renowned for its typical restaurants and fish cooking, based on just caught fish: shrimps, eels or cuttlefish, mantis shrimps’ and scallops’ appetizers, fish lasagne, fried squids, stew or grilled cuttlefish with vegetables directly grown in the island fields. To taste the best of Pellestrina hospitality and dive into a real village festival, you just have to land at the island on Saint Peter’s Festival, at the end of June, on the Visitation of the Blessed Virgin Mary’s day, at the beginning of August, or on Saint Stephen’s Festival, Portosecco patron saint, in mid-August: residents celebrate with tasty fish food, games, music and the traditional venetian rowing regatta. On the first Sunday of August the traditional Pellestrina regatta takes place, a well awaited event that calls on the island hundreds of rowing enthusiasts. 11th – 15th August: Saint Stephen’s Festival – Pellestrina, Piazza di Portosecco. Lido Island is a thin 12-kilometre-long stripe of land between Malamocco harbour in the south and San Nicolò harbour in the north, marking the borderline between Venice Lagoon on the west and the Adriatic Sea on the east. Residential areas are: Lido, Malamocco and Alberoni. By foot or by bicycle, from San Nicolò, the west end of Lido, you can go through wide tree-lined boulevards and then through a seafront promenade towards Malamocco harbour, appreciating Liberty and Art Deco Style hotels and villas. Lido Island, indeed, at the beginning of 20th century, reinvented itself becoming a desired holiday destination upon the European nobility. Later, Lido became famous for the prestigious Venice International Film Festival, that, between the end of August and the beginning of September, since 1932, calls on the island famous international stars, offering every year expositions, shows, press conferences, festivals and galas. However, Lido is not just that: there are also beautiful beaches, awarded with the Blue Flag year after year. The long sandy seashore is studded with Fortresses and Military Batteries, because the island had an important defensive role. To reach Alberoni you can tread the whole seafront promenade and then climb the Murazzi, the imposing seawalls made with Istrian Stone during the 18th century to defend the island from tides. Here and there you can bump into strange sculptures, created by locals with recycled material found on the beach. The picturesque medieval village of Malamocco is a worthwhile visit. Malamocco was one of the first urban settlement in the lagoon and it looks like a “little Venice” with its canals, calli and campielli. Its fish taverns were attended by Mario Soldati, Fellini and Hugo Pratt. One of the must-see monument is the Chief Magistrate Palace (Palazzo del Podestà), a permanent exhibition centre of archaeological finds about the history of Lido Island. At the southernmost end of Lido Island there is the WWF Nature Reserve “Alberoni Dunes”, located between the Adriatic Sea and the Lagoon. Alberoni name derives from the huge trees, which became the point of reference for sailor entering the port. Alberoni Oasis holds one of the largest and most preserved dunes system of the Northern Adriatic Coast. The dunes can reach even 10-meter height. The 30-hectare Reserve hosts different flora and fauna species and is now under the protection of the WWF. 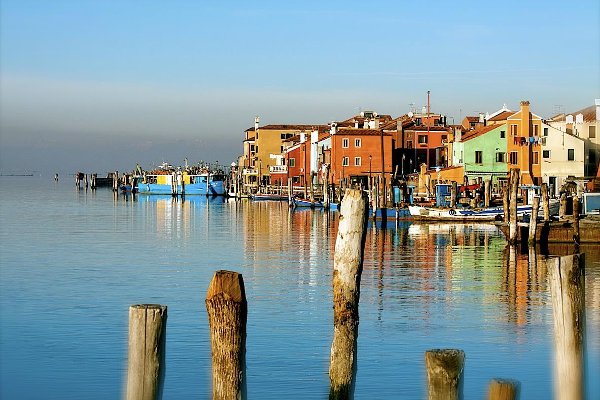 You can reach the islands of Pellestrina and Lido by boat, line 11, boarding area: Chioggia, Piazza Vigo.